Perhaps because it’s autumn. Or because I’ve recently heard from friends who don’t live nearby and wanted to touch base. It could be because I’ve recently reached out to other far away friends to do the same. I’m sure it’s because I recently reunited with friends who I love and cherish (yes…that’s you ‘Fern’…congrats again, ya’ll continue to be my inspiration). And no doubt it’s due to Lyle Lovett coming to town this week that has had me remembering the line from ‘Sun and Moon and Stars’. It’s a great song that showcases his haunting, vibrato voice and the lyric has stuck with me for years because it’s lost on me too…how the lives of friends go just like leaves in a wind. I often see leaves on the ground or crumbled like once-celebrated, yet forgotten confetti and think about the people who move in and out of our lives. (Admittedly, sometimes I’m quite pleased for those leaves to move on!) I wonder why some of those bonds of friendship are easily fractured while others seem to stay connected, even after years. It’s easy for me to get lost in thinking and non-thinking as I spend time with my horses. After the initial ‘Devouring of the Carrots’ phase upon my arrival, there is a patience, an understanding and a quality about them that few humans I know possess. And Max is teaching me the most. I’ve met and known a lot of intelligent people; some formally educated, some not at all. Folks with all sorts of initials and credentials behind their names, people who speak five and six languages, self-made millionaires (and one self-made billionaire), I’ve met people who have invented things that have changed how we live and have had the honor to meet highly accomplished politicians, writers and spiritual leaders. Yet each week I become more convinced that Max has as much to teach me as anyone. I’m a softy for white eye-lashes and Max’s are as white and long as you can imagine. His brown eyes seem almost soulful, he has stories and experiences that I’d like to think I’m beginning to hear. He can speak with his eyes and I’m beginning to learn his language. 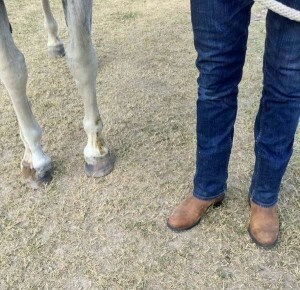 He was well-trained by the best..a Texas roping horse who carries on his body the scrapes and scars from his former job. He is big and has a mind of his own with a mule-like stubbornness at times but when he blinks those eyelashes, I melt. He knows exactly what he is doing and I don’t care. He knows that too. Max is teaching me a patience and understanding that I’ve never known and as I learn to ride and balance on him, he is teaching me his language. When I lean the wrong way into a turn, he corrects me by shifting his back and positioning me where I’m supposed to be. When he decides to test me by doing his own thing, I remind him that I’m in charge by asserting myself and he listens and responds, yet we both know that I am the student and he is the teacher. He may be the best teacher I’ve ever had. Recently we were walking side-by-side when nature decided to put on a show for us. As the sun began to slowly set on the beautiful farm, a great blue heron buzzed overhead so close I could feel the breeze…egrets flapped and flew as we slowly walked by…rabbits ran and frolicked in front of us. I reacted to every movement with excitement and joy on that beautiful evening and Max patiently, peacefully kept his pace, never once getting startled, never reacting – just accepting the show. And then it happened. As we turned to walk beyond the pond and toward an open field, I saw my first armadillo! I’ve seen dozens dead on the side of the road but never had I witnessed a live armadillo moving and trudging along in its pre-historic armor. As I recognized the armadillo, I immediately looked at Max and exclaimed, “Oh my god, an armadillo…that’s an armadillo Max, an armadillo!”. I was excited and filled with enthusiasm and I would bet my hand that was holding his rope that Max laughed. We stopped naturally and watched the armadillo toddle and trudge and I had no reason to contain my excitement about seeing the animal moving around while wearing what appeared to be a suit of armor. 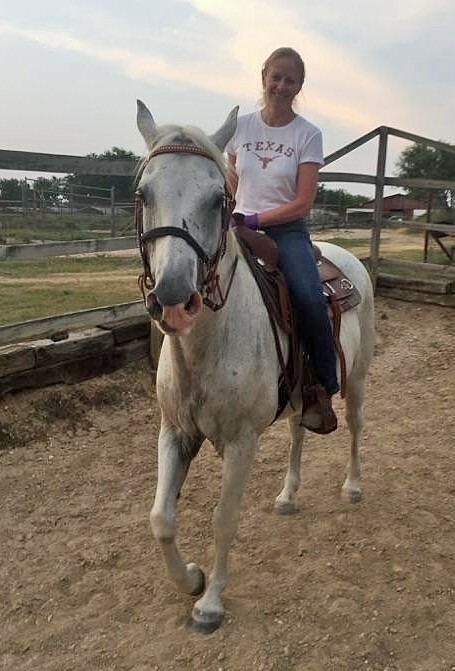 And Max, my 22-year old retired Texas roping horse who has seen and experienced way more of Texas than I have yet to even learn, stood and laughed at my joy in seeing the armadillo. I know it was not the first time Max had seen an armadillo yet I have no doubt that he enjoyed experiencing my first sighting. I cannot explain his laughter any more than I can explain how we communicate as I learn to ride and turn and cantor and gallop. 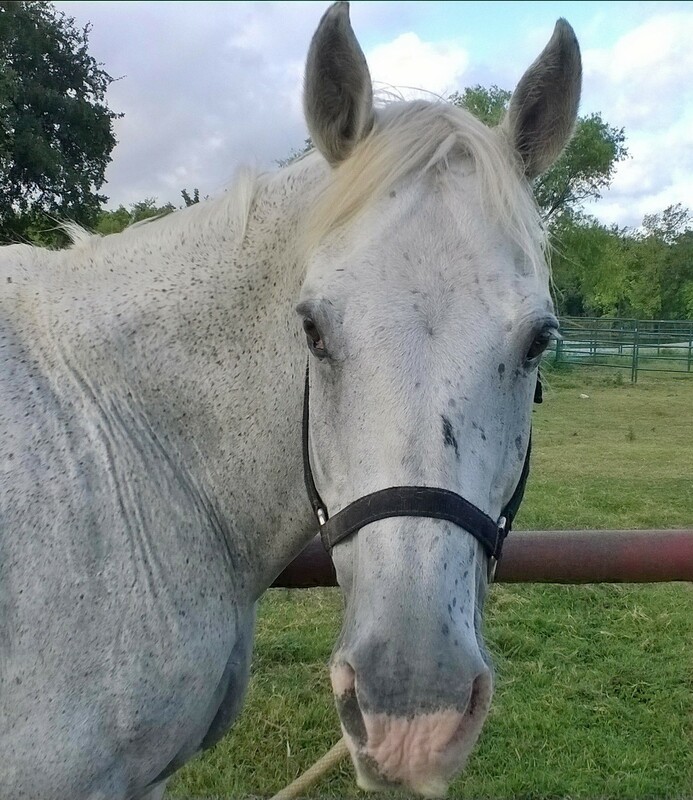 But at that moment on that beautiful Texas evening, I stood and watched the armadillo and my beautiful, wise white horse with the long white eyelashes stood patiently and laughed at my joy. And so I think about friends and how they are like leaves. They bud and grow and become a part of our lives and then sometimes they wither and fade and blow away while others hang onto the branch. On that gorgeous evening as the sun set and the world around us became quiet, I had the sense that Max is not going to blow away and neither am I. Max has so much to teach me and I make him laugh.